Submitted 3 months 1 week ago by Kog Hiller. 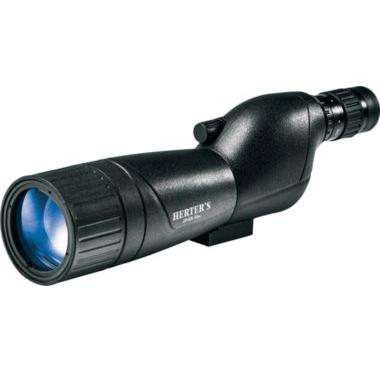 Herter's® 20-60x60 ST Spotting Scope Precision-engineered, fully coated lenses Anti-reflective coating brightens images in low light Rugged rubberized body withstands punishing use Includes a hard case and a sturdy tabletop tripod Variable-zoom eyepiece and quick-focus wheel With Herter's 20-60x60 ST Spotting Scope, you'll get the deer-busting brightness, clarity and magnification you want at a price you can easily afford. Plus, this money-saving bargain comes with a high-quality foam-padded hard case and a sturdy 9.5" tabletop tripod. The scope's precision-engineered, fully coated lenses deliver images so color-perfect and clear, you'll know in an instant which buck you'll be aiming for. Anti-reflective coating keeps images bright and brilliant, even during the low light of dusk and dawn. Variable-zoom eyepiece and quick-focus wheel combine to give you an easy and up-close view of your target. Rugged rubberized body delivers years of reliable durability. Compact, ergonomic design packs well and is easy to control. Includes lens covers. Cancer and Reproductive Harm- www.P65Warnings.ca.gov.